‘An Ethnographic study on the Singpho community of Assam‘ was carried out by the Institute of Research and Documentation of Indigenous Studies, (IRDIS) Assam, under the aegis of the Assam Institute of Research for Tribals and Scheduled Castes of Assam, AIRTSC, Khanapara, Assam during 2015-16. The field work was carried out in the Singpho villages of Ketetong, Inthem, Bisagaon, Dibong, Bahbari of the Magherita subdivision of Tinsukia district. The Singpho community,one of the most culturally, historically and socially rich tribes of north-east India. merits detailed research and documentation. Most of the information on history, traditional customs, beliefs and traditional knowledge have come down from ancient times through inter-generational oral communication within the community. . The ethnographic study on the Singpho community carried out by IRDIS brought out valuable information and interpretations with regard to their culture and traditional knowledge, social traditions and beliefs, environment, family life and livelihood, spirituality and many historical events. 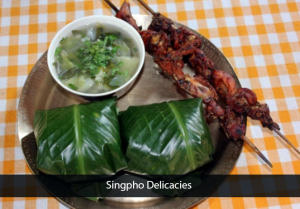 The Singpho people are spread over a large region, within and outside the country, comprising the eastern part of Assam, Lohit and Changlang districts of Arunaclal Pradesh, northern part of Myanmar and Yunan district of China. In Assam they are known as the Singphos, as Kachins in Myamar, and Jingphaws in China. Although divided by geographical boundaries they maintain a line of communication sharing their cultural traditions, religion and language.
. In 1823 it was the Singpho Chief, Bisa Gaam had presented a tea sapling and seeds to Robert Bruce . This magnanimous gesture of the Singpho tribe heralded the beginning of the tea industry in Assam. ‘Phalap’, the tea brewed from the leaves of the tea bushes that grow wild in the Singpho inhabited land, is their traditional drink. The Singpho community have appreciated IRDIS’s efforts in implementing this project. The research data and the ethnographic details compiled in a book form and comprising 17(seventeen) chapters have been submitted to AIRTSC. 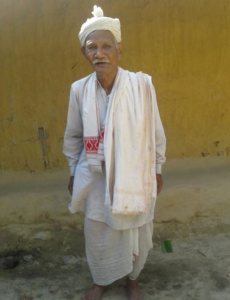 “An Ethnographic study on the Matak community of Assam” has been carried out by the Institute of Research and Documentation of Indigenous Studies, Assam, under the aegis of the Assam Institute of Research for Tribals and Scheduled Castes of Assam, AIRTSC, Government of Assam, during 2016-17 in the Matak villages of Tinsukia district. The Mataks are a historically, culturally and socially rich community of the north-eastern region of the country. The Ahom Buranjis refer to the fact that the Matak people belonged to the Tai Mongolian race that migrated to Assam from the Yunan province of China through the mountain passes of the Patkai ranges in the east. The Matak people have not documented by themselves the historical, social and cultural facets about their community. Most of the information available about the Matak community can be gleaned only from the historical notings of the Buranjis and other Ahom historical archives as also through the research and official notings of the British and from research works carried out by scholars in recent times. Hence the Matak community members appreciated IRDIS’s efforts in implementing this project. All members of the community participated actively and extended enthusiastic support to IRDIS. The field study for the project was conducted by a team of young members of the Matak community in the remote regions of the community habitats in Tinsukia. The field work team were guided and instructed by the IRDIS team and by the cultural experts of the community itself . The womenfolk and the menfolk of the Matak community, the youth and the community elders of the Tinsukia and Dibrugarh districts all extended full support and guidance and provided all the information that was necessary for the successful completion of this project. The research data and the ethnographic details compiled in a book form and comprising 5 (Five) chapters have been submitted to AIRTSC.